WACHTER ORIENTAL is global by default. By our nature the world is our playground, a spirit we fully exploit by matching the best possible opportunities of industrialised and emerging countries for our clients. We strongly believe in the vast potential of the region around the Indian Ocean, an ocean which, for centuries, has been an epicentre of trade in Asia and between Asia and Europe. Ancient cultures and trading communities are deeply rooted in this area. Economies from South East Asia to the East Coast of Africa, from Australasia to the Middle East and the entire Indian subcontinent have the potential to grow above the global average in the years to come. Thanks to the cultural, demographical and economic diversity, the economies around the Indian Ocean region are set for growth. The first half of the 21st century is the Asian age, while Australia is shaping up its natural resources and agricultural industry, the Middle East is diversifying to become less dependent on oil production and East Africa is working hard to have its foundations in place for further economic development and growth. Assisted by large investments in infrastructure, maturing of organisations such as ASEAN and an increasing number of free trade agreements, trade lanes between Europe and the Indian Ocean region will flourish in both directions as never before. Since its establishment in India in 2009, WACHTER ORIENTAL found it of great importance to be active along this trade lane, which forms the backbone of our “Axis of Growth” strategy. WACHTER ORIENTAL is truly local in Europe and in the Asia-Pacific region and is keen to help others explore “new territories” in both regions. We assist companies that want to venture into India and the Indian Ocean region or explore export to and distribution opportunities in Europe and the Asia-Pacific region. 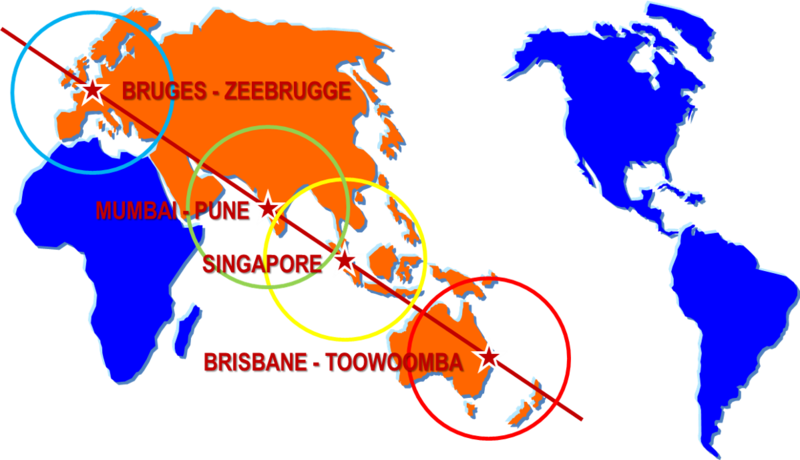 We are active in Australasia, Europe, India and South East Asia . Our services are 100% tailor-made and our support comprises local trade , investment , distribution and engineering activities. We encourage our clients to “Think Global, Act Local” and practically assist them to do so. WACHTER ORIENTAL is happy to welcome you home in Europe & Asia-Pacific !